Recorded in stereo at New York’s famous Village Vanguard on July 16, 1967, this is a remarkable album from this great pianist whose style is rooted in jazz, blues, funk, and R&B. 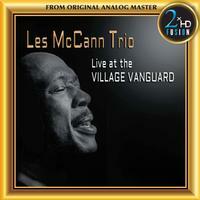 This is one of Les McCann’s last recordings in the jazz style before he turned to a more commercial R&B & singing career. Les McCann reached the peak of his career at the 1969 Montreux Jazz Festival, recording "Compared to What" and "Cold Duck Time" for Atlantic (Swiss Movement) with Eddie Harris and Benny Bailey. McCann first gained some fame in 1956 when he won a talent contest in the Navy as a singer that resulted in an appearance on television on The Ed Sullivan Show. After being discharged, he formed a trio in Los Angeles. McCann turned down an invitation to join the Cannonball Adderley Quintet so he could work on his own music. He signed a contract with Pacific Jazz and in 1960 gained some fame with his albums Les McCann Plays the Truth and The Shout. His soulful, funk style on piano was influential and McCann's singing was largely secondary until the mid-'60s. He recorded many albums for Pacific Jazz during 1960-1964, mostly with his trio but also featuring Ben Webster, Richard "Groove" Holmes, Blue Mitchell, Stanley Turrentine, Joe Pass, the Jazz Crusaders, and the Gerald Wilson Orchestra. After the success of Swiss Movement, McCann emphasized his singing at the expense of his playing and he began to utilize electric keyboards.